If you are in need of a rear mount, mid mount or tiller ladder truck, look no further than Fire Line Equipment for a quality inventory of used ladder trucks and aerial platforms for sale. These trucks are specially designed for aerial rescue and firefighting operations. We strive to only buy, sell and advertise quality pre-owned and certified used ladder trucks. Our inventory consists of used ladder towers, squrt, telesqurt and straight stick ladders from 50′ to 110′ and in some cases longer. 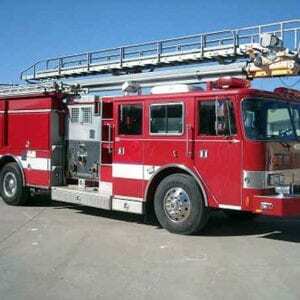 This used fire truck page of our website may include aluminum and steel constructed aerials, ladders and platforms that may be articulating depending on the vehicle specifications. We advertise and sell E-ONE, Sutphen, Seagrave, Pierce, KME, LTI, Smeal, RK, AI, Aerialscope, and ALF aerial devices. Please use the links below view the specifics of each used ladder truck for the individual used fire truck for sale. Our inventory changes often so be sure to check our website regularly for new listings of used fire trucks, service and fire truck part specials and industry news. If you are in need of a rear mount, mid mount or tiller ladder truck, look no further than Fire Line Equipment for a quality inventory of used ladder trucks and aerial platforms for sale. These trucks are specially designed for aerial rescue and firefighting operations. We strive to only buy, sell and advertise quality pre-owned and certified used ladder trucks. Our inventory consists of used ladder towers, squrt, telesqurt and straight stick ladders from 50′ to 110′ and in some cases longer. 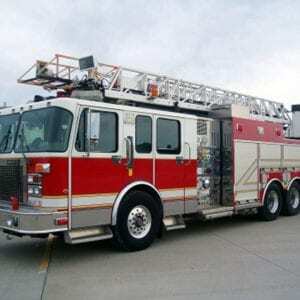 This used fire truck page of our website may include aluminum and steel constructed aerials, ladders and platforms that may be articulating depending on the vehicle specifications. We advertise and sell E-ONE, Sutphen, Seagrave, Pierce, KME, LTI, Smeal, RK, AI, Aerialscope, and ALF aerial devices. Please use the links below view the specifics of each used ladder truck for the individual used fire truck for sale. Our inventory changes often so be sure to check our website regularly for new listings of used fire trucks, service and fire truck part specials and industry news. Contact our Sales Department at 877-346-1373.